With such wonderful characters from XianJian QiXia Zhuan, there was bound to be an abundance of fans cosplaying their favourites! Cosplay (short for costume play) is a type of performance art where fans dress up as their favourite characters, often creating the outfits themselves. Here are some of my favourite XianJian Qi Xia Zhuan cosplay photos I’d like to share! Xingyun also does a great job cosplaying as A’nu 阿奴 here. Very accurate and detailed! Definitely one of the best A’nu cosplays I’ve seen. 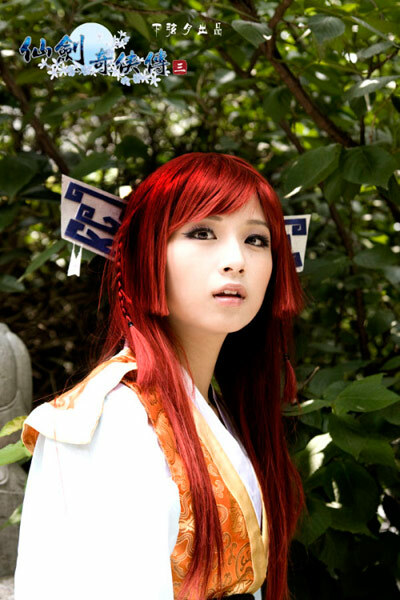 There’s not many cosplays from XianJian 2, let alone such a pretty one of Shen Qishuang 沈欺霜. I think her facial expression and posture looks great. Would be nice to see some full body shots too. Long Kui 龍葵 cosplay by Miyoko, photographed by shiroang. I was mesmerised by this depiction of Long Kui! The detail is amazing and I love what she did with her eye make-up. Ghostly yet attractive at the same time, this Red Kui gives me the chills! Another one with great eye make-up and costume too. Long Kui blue and red…both rather accurate to the original designs. The main characters from the Chinese Paladin 3 side story. It’s hard finding quality group shots but this one was done well. Oh looky! There’s already some gorgeous cosplays of the upcoming Xian Jian 5 game, and it’s not even released yet! We’re bound to see even more once the game is released in about 2 months time. One of the best 小蛮 cosplays I’ve seen. It looks like she came straight out of the game! Which are your favourites? Do you have some awesome cosplays to share? Leave a comment and let us know!